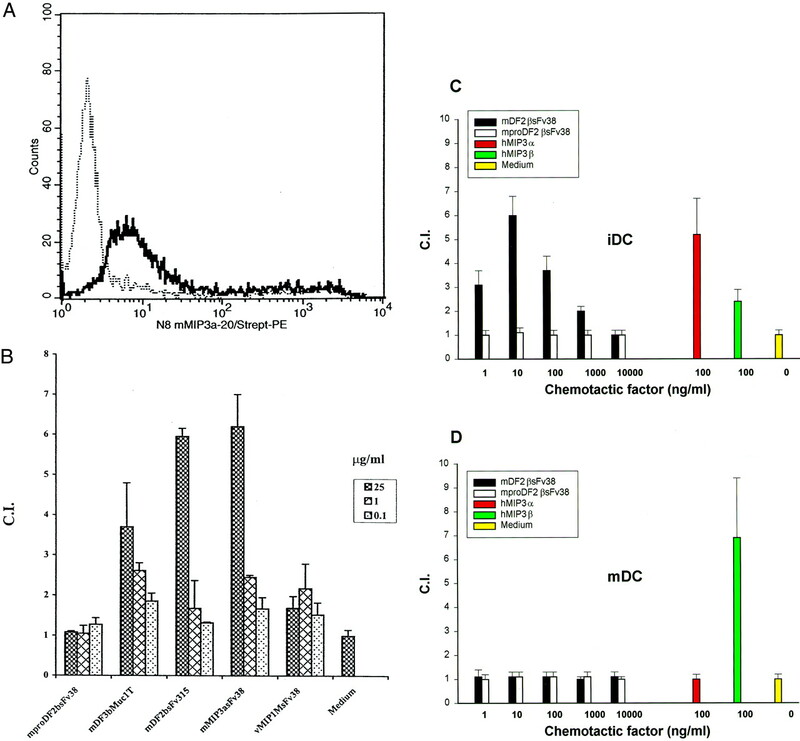 Chemokine receptors are differentially expressed on immature and mature dendritic cells (DC). Herein, we demonstrate for the first time that murine antimicrobial peptides β-defensins 2 and 3 bind murine CCR6, similarly to inflammatory chemokine macrophage-inflammatory protein 3α, and they chemoattract bone marrow-derived immature, but not mature DC. Using various chemokines or defensins fused with nonimmunogenic tumor Ags, we studied their capacity to delivery Ags to subsets of immune cells to elicit antitumor immunity. We demonstrate that DNA immunizations with fusion constructs with β-defensin 2 or inflammatory chemokines that target immature DC, but not homeostatic chemokines secondary lymphoid tissue chemokine, CCL21, or stromal cell-derived factor 1, CXCL12, which chemoattract mature DC, elicit humoral, protective, and therapeutic immunity against two different syngeneic lymphomas. Active immunotherapy based on the targeting of idiotypic Ag (Id), expressed by malignant B cell, is considered one of the most promising human cancer vaccine approaches (1). Although approaches to render lymphoma Id or its unique Fv fragment, a single-chain Ab (sFv),3 immunogenic in mice by fusion to cytokines or with immunogenic fragments of toxins have been reported, no single strategy has emerged that delivers tumor Ags to APC and induces both humoral and T cell immunities (2, 3, 4). A growing number of reports support the hypothesis that activation of the innate immune system through pattern recognition receptors by evolutionary distant pathogens is essential for initiation of adaptive immunity (5, 6). Moreover, optimal recognition of self-tumor Ags and induction of proinflammatory, rather than tolerogenic, responses may require activation of innate immunity by a danger signal (7) and the engagement of pattern recognition receptors, which induces up-regulation of CD80 and CD86 costimulatory molecules and production of various proinflammatory mediators, including chemokines (5, 8, 9, 10). Chemokines are distinguished as inflammatory (inducible) or homeostatic (constitutive), based on their pathophysiological activities (11). Inflammatory chemokines are expressed during infection or tissue damage by resident and infiltrated leukocytes. In contrast, homeostatic chemokines are usually produced constitutively in discrete microenvironments, and they are involved in maintaining the physiological trafficking of immune cells (11). The cell trafficking is regulated by differential expression of heterotrimeric Gi protein-coupled seven-transmembrane domain chemokine receptors (12). For example, CCR1, CCR2, CCR5, and CCR6 are preferentially expressed on immature DC (iDC) (13). CCR6 also expressed on CD1a+ Langerhans cells (LC) precursors (14), CD34+-derived DC, and CD11b+ Peyer’s patch myeloid, but not CD8a+ lymphoid, DC (15). Upon maturation of DC, the expression of these receptors is down-regulated, while that of other receptors, such as CCR7, is up-regulated, which enables homeostatic chemokines macrophage-inflammatory protein 3β (MIP-3β; EBV-induced molecule 1 ligand chemokine, CCL19 (ELC)) and secondary lymphoid tissue chemokine, CCL21 (SLC), to recruit mature DC in lymph node (16, 17). Recently, it has been demonstrated that human β-defensin 2, an antimicrobial peptide involved in innate immunity against infection, binds to the chemokine CCR6 (18). Defensins are proposed to play a role in inflammation, wound repair, and regulation of the specific immunity by inducing the expression of cytokines and chemokines, the production of histamine (19), and enhancing Ab responses (20). Perhaps a general strategy for induction of effective adaptive immunity against weakly immunogenic tumor Ags may be to target the delivery of such Ags to receptors on professional APC by linkage to their β-defensins or proinflammatory chemokine ligands. Recently, we reported that lymphoma Id or sFv could be rendered immunogenic in mice by fusion to a chemokine moiety such as monocyte chemoattractant protein 3 (MCP-3) (21), suggesting that chemokines could be an efficient carrier for tumor and other Ags by targeting APC via chemokine receptors. Herein, using various chemokines and defensins, we demonstrate that protective antitumor immunity depends on the ability of the vaccine to target immature, but not mature, DC. Thus, MIP-3α and β-defensins render otherwise nonimmunogenic tumor Ags immunogenic and induce protective and therapeutic antitumor immunity. In contrast, immunizations with homeostatic chemokines SLC or SDF1β do not elicit antitumor immunity. Although both humoral and cellular immune responses are required for rejection of the more aggressive 38C13 tumor that expresses IgM primarily on its surface (17, 21), only cellular, but not humoral, immunity, is protective for slower growing A20 lymphoma, which largely secretes its idiotypic Ag. Thus, the breadth of this approach as a general strategy for vaccine development was also made apparent by its ability to elicit for the first time eradication of established A20 lymphoma. Cloning strategies for lymphoma-specific VH and VL fragments from 38C13 (22) and A20 (23) cells as sFv38 and sFv20, respectively, with MCP-3 and IFN-γ-inducible protein 10 (IP-10) were described previously (21). Genes for mature murine β-defensins were cloned from LPS (10 ng/ml)-treated BALB/c mouse skin in-frame to the 5′ end of sFv by RT-PCR from total RNA using specific primers as described previously (21). The following pairs of primers were used: for β-defensin 2 (GenBank accession no. AJ011800), PRmDF2β-5′ (ACCATGGAACTTGACCACTGCCACACC) and PRmDF2β-3′ (TGAATTCAAGATCTTTCATGTACTTGCAACAGGGGTTGTT); and for β-defensin 3 (GenBank accession no. AF092929), PRmDF3β-5′ (ACCATGGAAAAAATCAACAATCAGTAAGTTGTTTGAGG) and PRmDF3β-3′ (CTCGAGCTAGAATTCTTTTCTCTTGCAGCATTTGAGGAAA). The β-pro-defensin 2 gene was cloned for eukaryotic expression using PRproDF2βL-5′ (AAAGCTTCCACCATGAGGA CTCTCTGCTCT) and PRmDF2β-3′, which contained native secretion signal sequence. SDF-1β (GenBank accession no. HSU16752) was cloned from 10 ng/ml LPS-treated human monocytes using PRhSDF1β-5′ (CTCTAGACACCATGAACGCCAAGGTCGTGGTCGTGCTG) and PRhSDF1β-3′ (TGAATTCCATCTTGAACCTCTTGTTTAAAGCTTT). Murine MIP-3α (GenBank accession no. AJ222694) was cloned from a mixture of thymus and kidney cDNA using PRmMIP3α-5′ (ACCATGGCAAGCAACTACGACTGTTGCCTC) and PRmMIP3α-3′ (ATAGAATTCCATCTTCTTGACTCTT AGGCTGA). Murine SLC (GenBank accession no. U88322) was recloned from the plasmid (gift from Dr. Shakhov, Science Application International Corp.-Frederick) using PRmSLC-5′ (ACCATGGATGGAGGGGGACAGGACTGCT) and PRmSLC-3′ (ATAGAATTCTCCTCTTGAGGGCTGTGTCTGT). All constructs were verified by the DNA dideoxy sequencing method (Amersham, Arlington Heights, IL) and purified using a plasmid purification kit (Qiagen, Valencia, CA). Recombinant fusion proteins purified as inclusion bodies after 8 h of induction in SuperBroth (Digene Diagnostics, Beltsville, MD) with 0.8 mM isopropyl β-d-thiogalactoside as described previously (21) and refolded according to Buchner et al. (24). The refolded fusion proteins were purified by heparin-Sepharose chromatography (Pharmacia Biotech, Uppsala, Sweden). The integrity and purity (>90%) of recombinant proteins were tested by PAGE and Western blot hybridization with 9E10 anti c-myc mAb (Sigma, St. Louis, MO). Correct folding of purified sFv38 proteins was determined by the ability to bind to anti-idiotype mAb S1C5 in ELISA (21). Briefly, serially diluted sFv were added to microtiter plates coated with 10 μg/ml anti-c-myc mAb 9E10. After washing, plates were incubated with 1/300 diluted biotin-labeled S1C5, followed by streptavidin-HRP (1/5000; The Jackson Laboratory, Bar Harbor, ME), and developed with ABTS peroxidase substrate (Kirkegaard & Perry, Gaithersburg, MD). Proteins were biotinylated using EZ-Link sulfo-NHS-LC-biotin following the manufacturer’s protocol (Pierce, Rockford, IL). Isolation of murine bone marrow-derived DC was described previously (25). Briefly, bone marrow was collected from tibias and femurs of 4- to 6-mo-old BALB/c mice. Erythrocytes were lysed with ACK lysis buffer (BioWhittaker, Walkersville, MD). CD8+, CD4+, B220+, and I-Ab cells were depleted using a mixture of mAbs and rabbit complement. The mAbs were TIB-146 (anti-B220), TIB-150 (anti-CD8), TIB-207 (anti-CD4), and TIB-229 (anti- I-Ab) obtained from American Type Culture Collection (Manassas, VA). Cells were cultured in DC medium (RPMI 1640 containing 5% heat-inactivated FBS, 1% penicillin, streptomycin, 1% l-glutamine, and 5 × 10−5 2-ME) containing 10 ng/ml each of murine IL-4 and GM-CSF (PeproTech, Rocky Hill, NJ). Adherent cells were harvested on days 4 and 7 and used in subsequent experiments. DC were matured by TNF-α (10 ng/ml; BD PharMingen, San Diego, CA) overnight in DC medium. Immature DC on days 4–5 of culture were in general CD11+ (69%), B7.2+ and I-Ab+ (21%), B7.2− and I-Ab+ (18%), and CD40+ (27%). Upon maturation, the DC were CD11c+ (87%), B7.2+ and I-Ab+ (62%), B7.2− and I-Ab+ (3%), and CD40+ (87%). The following mAb were used for FACS: CD-11c-APC, MAC3-PE, Gr-1-FITC, B220-PE, Thy 1.2-FITC, I-Ab-FITC, B7.2-PE, and CD40-PE (BD PharMingen). The migration of DC (50 μl, 106 cells/ml) was assessed using a 48-well microchemotaxis chamber (NeuroProbe, Cabin John, MA) with a 5-μm polycarbonate filter (Osmonics, Livermore, CA) as previously described (26, 27). Cells were incubated at 37°C in humidified air with 5% CO2 for 1.5 h. DC migrating across the filter were counted using a Bioquant semiautomatic counting system (Bioquant, Nashville, TN). The results (mean ± SE of triplicate samples) are presented as the chemotactic index, defined as the fold increase in the number of migrating cells in the presence of test factors over the spontaneous cell migration (in the absence of test factors). Human MIP-3α and MIP-3β were obtained from PeproTech. The carcinogen-induced, C3H 38C-13 B cell lymphoma (22) was a gift from Dr. R. Levy (Stanford, CA). The 38C-13 tumor secretes and expresses IgMκ on the cell surface. The BALB/c A20 lymphoma (23) was obtained from the American Type Culture Collection and expresses IgGκ. Murine CCR6-expressing HEK293 cells (HEK293/CCR6) were a gift from Dr. J. Farber (National Institute of Allergy and Infectious Disease, National Institutes of Health, Bethesda, MD). Trypsinized HEK293/CCR6 or HEK293 cells (2.5 × 106 cells/ml) were incubated with 20 μg/ml biotinylated mMIP3αsFv38 for 30 min on ice in PBS with 2% BSA (PBS/BSA) and 20% mouse serum. Cells were stained on ice for 30 min with 0.2 μg/ml streptavidin-PE (BD PharMingen) and fixed with 1% paraformaldehyde. Animal care was provided in accordance with the procedures outlined in a Guide for the Care and Use of Laboratory Animals (National Institutes of Health Publication 86-23, 1985). Six- to 12-wk-old female C3H/HeNCrlBR or BALB/c mice (Charles River Laboratories, Frederick, MD) were used. Mice (10/group) were immunized with the Helios Gene Gun System (Bio-Rad, Hercules, CA) with 1–2 μg of plasmid DNA three times per 2 wk as previously described (21). Two weeks after the last immunization, mice were challenged i.p. with 2 × 103 or 2.5 × 105 38C13 or A20 lymphoma cells, respectively, and followed for survival. Differences in survival between groups were determined by nonparametric log-rank test (BMDP Statistical software, Los Angeles, CA). The p values refer to comparisons with the group immunized with DNA expressing the same chemokine or defensin fused with an irrelevant sFv or sFv fused with mutant chemokine, unless otherwise specified. Six- to 12-wk-old female BALB/c mice (10/group) were challenged with 2.5 × 105 syngeneic A20 tumor cells. On days 1, 4, 8, and 18, these mice were gene gun immunized with DNA plasmid (containing ∼1–2 μg of DNA/immunization), and mice were followed for tumor progression. BALB/c mice were gene gun immunized with 1–2 μg of pMCP3sFv20 twice biweekly, and splenocytes and sera were removed 10 days after the last immunization. Ten BALB/c mice per group were i.p. injected in saline with 2.5 × 105 A20 tumor cells/mouse mixed with 2 × 107 splenocytes or sera from immune or mock-treated mice, and mice were followed for tumor progression. First, we cloned and purified a variety of chemokine and β-defensin fusion proteins with sFv, a lymphoma Ig-derived nonimmunogenic Fv from the two different B cell lymphomas, 38C-13 and A20 (Table I⇓). For example, sFv fusion proteins with murine inflammatory chemokine MIP-3α, murine β-defensin 2, and β-defensin 3 were designated mMIP3αsFv38, mDF2βsFv38, and mDF3βsFv38 or mMIP3αsFv20, mDF2βsFv20, and mDF3βsFv20, respectively. Similarly, sFv fusion proteins with homeostatic chemokines SLC and SDF1β were designated mSLCsFv38 and SDF1βsFv38, respectively. Control proteins contained either sFv fusions with mutant chemokine, generated by replacing the first Cys residue with Ser or by truncation of the amino termini to abrogate a respective receptor-binding, or an inactive form pro-defensin 2, β-defensin 2, with its pro-sequence (mproDF2βsFv38; Table I⇓). All fusion proteins had comparable idiotype folding, as tested by inhibition ELISA with anti-Id mAbs, which bind only properly folded parental lymphoma Id (data not shown). The functional integrity of these proteins was tested by their ability to induce chemotaxis of murine APC and THP-1 cells and binding to the chemokine receptor-transfected cells. CCR6-transfected, but not parental, HEK293 cells specifically stained with biotinylated murine MIP-3α fusion protein (Fig. 1⇓A). Furthermore, as expected, chemokine fusion proteins, but not control mutant fusion proteins, induced chemotaxis of THP-1 cells (data not shown) or murine DC (Fig. 1⇓, B–D). Since human β-defensin 2 was reported to interact with CCR6, we tested murine β-defensin fusion proteins for their ability to induce chemotaxis of murine CCR6-transfected cells, HEK293/CCR6. These cells were chemoattracted by murine MIP-3α (a ligand of CCR6) fusion protein (mMIP3αsFv38; Fig. 1⇓B). Both fusion proteins β-defensins 2 and 3, but not fusion proteins β-defensin 2 containing pro-sequence (mproDF2β2sFv38) or control viral chemokine (vMIP1 MsFv38), chemoattracted murine CCR6-expressing cells in a dose-dependent manner (Fig. 1⇓B). A control parental cell line, HEK293, which does not express CCR6 was not attracted to these proteins (data not shown). Next, we tested the ability of these proteins to attract murine bone marrow-derived DC, which are known to express CCR6 (13, 14). The purity of murine bone marrow-derived DC cells and their immature phenotype on day 4 of cultivation was confirmed by expressions of CD11c+ and low levels of I-A, B7.2, and CD40, respectively (data not shown, see Materials and Methods). Similarly to MIP-3α (data not shown), both β-defensin fusion proteins induced chemotaxis of immature DC in a dose-dependent manner, with peak activity at 10 and 100 ng/ml for mDF2βsFv38 (Fig. 1⇓C) and mDF3βsFv38 (data not shown), respectively. The predominant immature phenotype of these DC was also supported by their ability to migrate to human MIP-3α, a chemoattractant specific for CCR6+ immature DC (16, 28), and their limited ability to react to human MIP-3β (13), a chemoattractant specific for CCR7+ mature DC (Fig. 1⇓C). In contrast, none of the defensin and MIP-3α fusion proteins stimulated chemotaxis of TNF-induced mature DC, which migrated to MIP-3β (Fig. 1⇓D). Furthermore, control fusion protein with mutant MIP-3α (data not shown) or mproDF2βsFv38 did not induce chemotaxis of any DC (Fig. 1⇓, B–D). Therefore, murine β-defensin 2 and 3 fusion proteins can specifically target iDC and induce their CCR6-mediated chemotaxis, similarly to MIP-3α. Integrity of fused defensin and chemokine moieties. A, Recombinant sFv fusion protein with murine MIP-3α (mMIP3αsFv38) retains the ability to bind CCR6. Biotin-labeled (mMIP3αsFv38; 20 μg/ml) was incubated on ice with either CCR6-expressing CCR6/HEK293 cells (thick line) or parental HEK293 cells (thin lines). Bound proteins were detected with streptavidin-PE. Histograms of gated cells (R1 in forward scatter/side scatter plot) are presented. β-Defensin 2 (mDF2βsFv38) or β-defensin 3 (mDef3βsFv38), but not pro-defensin 2 (mproDF2βsFv38) or control mutant chemokine (vMIP1MsFv38), induce chemotaxis of CCR6/HEK293 (B) and murine bone marrow-derived immature (C), but not mature (D), DC. Maturation of DC was induced by overnight incubation in GM-CSF- and IL-4-containing medium with TNF-α (10 ng/ml; BD PharMingen). 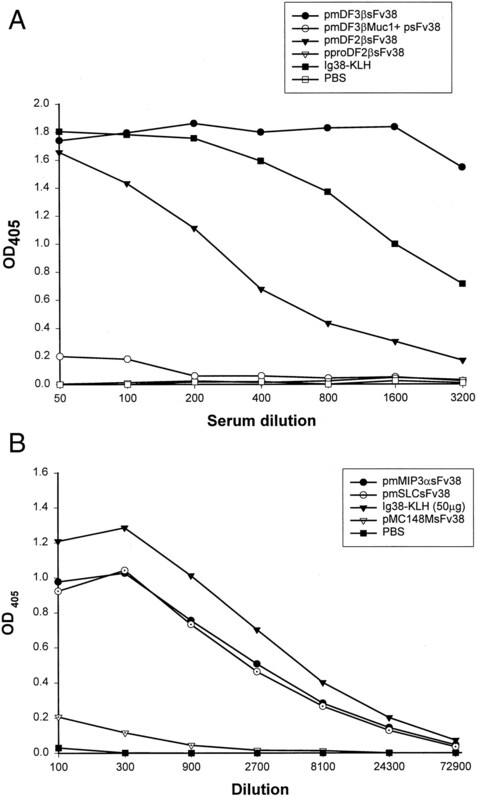 In vitro chemotaxis was performed as described in Materials and Methods by incubating titrated amounts of the purified sFv fusion proteins (nanograms per milliliter). Human MIP-3α and MIP-3β (100 ng/ml) or medium alone were used as controls. The results are shown as the chemotaxis index (C.I. ± SD; average of triplicate wells). Similar results were obtained from three separate experiments. The lymphoma idiotype alone is nonimmunogenic in syngeneic mice. Similarly, DNA immunizations with lymphoma-derived Fv or sFv alone, particularly from 38C13 and A20 lymphomas, do not induce immunity in syngeneic mice (21). Therefore, we tested whether a fusion construct of inflammatory peptides, such as MIP-3α or β-defensins, with these sFv Ags would induce specific immunity when administered as a DNA vaccine in mice. Ten mice per group were immunized by gene gun with plasmids encoding fusion proteins consisting of mature forms of β-defensins (pmDF2βsFv38 and pmDF3βsFv38, respectively) or MIP-3α (pmMIP3αsFv38). Control mice were immunized with DNA constructs encoding sFv fused with inactive pro-defensin (pproDF2βsFv38) or mutated and inactive chemokines (pvMC148MsFv38). Furthermore, as will be discussed below, no Ab was generated when mice were immunized with 2 μg DNA expressing a mixture of plasmids containing unlinked sFv and murine β-defensin (pmDF3βMuc1 and sFv38; Fig. 2⇓A) or chemokine (data not shown). In contrast, mice immunized with plasmids encoding sFv fusion proteins with murine β-defensins (Fig. 2⇓A), MIP-3α, or SLC (Fig. 2⇓B) produced idiotype-specific Ab levels comparable to those induced by vaccination with tumor-derived intact Ig protein conjugated to keyhole limpet hemocyanin (KLH; Fig. 2⇓). However, control mice immunized with an inactive pro-β-defensin (pproDef2βsFv38) or mutant chemokine sFv fusion constructs (pvMC148MsFv38; Fig. 2⇓B) or with sFv38 alone (data not shown) did not produce any anti-Id Ab responses. Interestingly, the two types of β-defensins differed in their capacity to elicit Ab responses; although both produced predominantly specific IgG1 Abs, β-defensin 3 was superior to β-defensin 2 for induction of specific Abs to every Ag tested (Fig. 2⇓). Vaccination with DNA expressing sFv38 fused with β-defensins (A) or MIP-3α and SLC (B) induces a humoral response. Syngeneic C3H mice were gene gun immunized three times biweekly with DNA vaccines encoded with sFv fused with murine β-defensins 2 and 3, pmDF2βsFv38. Control groups of mice received DNA vaccines expressing sFv38 fused with inactive β-pro-defensin, pproDF2βsFv38, or i.p. with 50 μg of Ig38-KLH protein vaccine. Also, to assess the importance of physical linkage, mice were immunized with DNA encoding free unlinked sFv38 and active β-defensin 3 fused with irrelevant Muc1 peptide, pmDF3βMuc1 + psFv38. Anti-idiotypic Ab levels of pooled randomly drawn sera from five mice 2 wk after the last immunization were determined by ELISA as previously described (43 ). Briefly, serum was diluted over microtiter plates coated with 10 μg/ml native Ig38 protein. Id-specific serum Ab levels were detected by incubation with goat anti-mouse IgG(Fc)-HRP Abs (The Jackson Laboratory). Results were quantified by comparing serum titration curves with a standard curve obtained with a known concentration of purified monoclonal anti-idiotype Ab (SIC5) diluted starting from 10 μg/ml. The specificity for idiotype was shown by the lack of binding on a control, isotype-matched IgM (TEPC-183, Sigma; data not shown). The vaccine protocol used to elicit protective antitumor immunity was as follows. First, mice were immunized with 2 μg of DNA constructs three times at biweekly intervals, then 2 wk after the last immunization mice were challenged with a 20-fold lethal dose of syngeneic tumor. No survival was observed in control groups immunized with PBS or plasmids encoding sFv38 fused with inactive pro-β-defensin-2 (pproDef2βsFv38; Fig. 3⇓A), with irrelevant chemokine plasmid vaccines pMDC-EGFP (Fig. 3⇓A), or with mutant constructs pMC148MsFv38 (Fig. 3⇓B). In contrast, significant protective immunity was elicited in mice immunized with pmDF2βsFv38 (Fig. 3⇓A) or pmDF3βsFv38 (Fig. 3⇓B; by log-rank test, p < 0.001 and 0.004 compared with pproDF2βsFv38 and pMC148MsFv38, respectively). The protection elicited with both β-defensin constructs was comparable to that induced by Ig-KLH protein vaccine (Fig. 3⇓A), a prototype vaccine that consists of lymphoma-derived IgM cross-linked with KLH that is being successfully tested in a Phase III clinical trial (1). Similarly, as shown in Fig. 3⇓B, DNA immunizations with MIP-3α fusions elicited potent tumor protection (pmMIP3αsFv38, by log-rank test, p < 0.0001 compared with pMC148MsFv38). In contrast, none of the mice immunized with constructs encoding sFv fusion with homeostatic chemokine murine SLC were protected (Fig. 3⇓B; pmSLCsFv38; by log-rank test, p < 0.02 compared with pmMIP3αsFv38) despite the fact that this SLC fusion construct generated anti-Id-specific Abs comparable to the pmMIP3αsFv38-vaccinated group (Fig. 2⇑B). Moreover, no immunity was detected in mice immunized with constructs expressing human SDF1β, which binds to murine CXCR4 (data not shown). Therefore, these data suggest that fusion constructs with inflammatory mediators, such as β-defensins or MIP-3α, which target immature DC, can render a nonimmunogenic tumor Ag (sFv) immunogenic and elicit protective antitumor immunity even for a very aggressive lymphoma, 38C13, which kills all control mice within 20 days postchallenge. Mice immunized with constructs expressing sFv fusion proteins with β-defensins or MIP-3α, but not SLC, elicit antitumor-protective immunity in 38C13 tumor model. A survival plot of 10 mice/group per experiment is shown (A and B). C3H mice were challenged with a 20-fold lethal dose of 38C13 tumor cells 2 wk after the last immunization with DNA constructs encoding sFv fused with either murine β-defensins 2, pmDF2βsFv38 (A), or murine β-defensin 3, pmDF3βsFv38, murine MIP-3α, pmMIP3αsFv38, or murine SLC, pmSLCsFv38 (B). Control mice were immunized with DNA expressing sFv38 fusion with inactive β-pro-defensin, pproDF2βsFv38, irrelevant chemokine-expressing plasmids phMDC-EGFP (A) and pMC148MsFv38 (B), or i.p. with 50 μg of Ig38-KLH protein vaccine or 200 μl PBS. The log-rank p value is for comparison with pproDF2βsFv38 (A) and pMC148MsFv38 (B). The p* value is a comparison between pmMIP3αsFv38 and pmSLCsFv38, and the p** value is a comparison between pSLCsFv38 with pMC148MsFv38 (B). Mice vaccinated with pmMIP3αsFv38 or pmSLCsFv38 generate comparable levels of anti-idiotypic Ab. The experiment was repeated three (A) and five (B) times. Next, we decided to test whether fusion constructs can eradicate an established tumor. We used the A20 model (23), which is relatively slower growing, to test the therapeutic potency of the approach. Previously we reported that in this tumor model, in which the prototype Ig-KLH protein vaccine failed, mice immunized without the use of adjuvants and given only sFv20 fusion protein with inflammatory chemokine MCP-3 developed protective antitumor immunity (21). We therefore assessed the therapeutic efficacy of the DNA constructs. Ten mice per group challenged with 2.5 × 105 A20 tumor cells were immunized the next day with 2 μg DNA constructs encoding sFv20 fusions with inflammatory chemokines, such as MCP-3 (pMCP3sFv20; Fig. 4⇓, A and B), IP-10 (pmIP10sFv20, Fig. 4⇓A), and MIP-3α (pmMIP3αsFv20; Fig. 4⇓B). The mice were immunized with three booster vaccinations at 4, 8, and 18 days posttumor challenge. Tumor-bearing mice randomized to control treatment with the same chemokine, but fused with sFv derived from the 38C-13 lymphoma (pMCP3sFv38, Fig. 4⇓, A and B), sFv20 alone (data not shown), or A20 lymphoma-derived Ig-KLH protein (data not shown) did not survive. 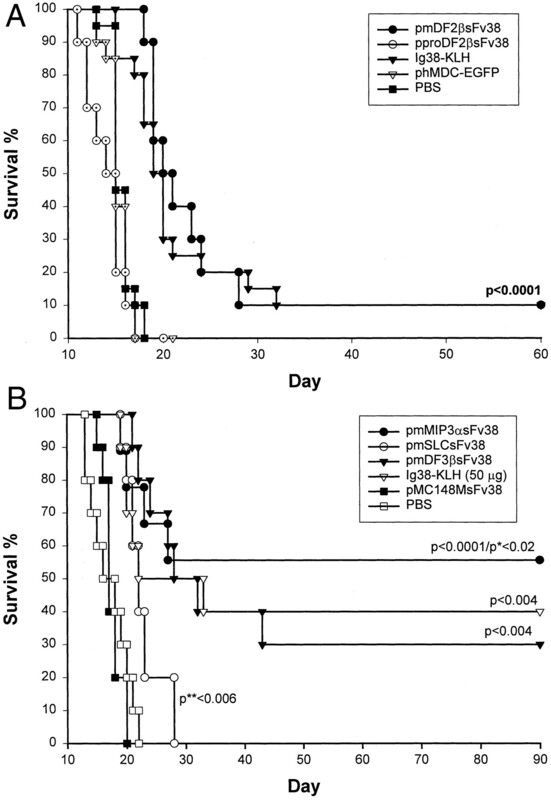 In contrast, significant survival was observed in pMCP3sFv20 (by log-rank test, p < 0.01 compared with pMCP3sFv38; Fig. 4⇓, A and B) or pmMIP3αsFv20 (by log-rank test, p < 0.0003 compared with the mock group; Fig. 4⇓B)-treated mice. Furthermore, angiostatic or other nonspecific effects of functional chemokines, as potentially induced by IP-10, were apparently not sufficient for tumor eradication (Fig. 4⇓A). No mice survived in the pmIP10sFv20 immunization group (Fig. 4⇓A), which is in concordance with lack of CXCR3 expression on skin iDC. Therefore, these data demonstrate that nonimmunogenic tumor Ag fused with inflammatory chemokines MIP-3α and MCP-3, but not IP-10, which bind receptors expressed on iDC (13, 14), induce potent therapeutic antitumor immunity. Genetic immunizations with constructs expressing sFv fusion proteins with ligands to target immature DC elicit antitumor therapeutic immunity and eradicate established tumor. Ten BALB/c mice per group were challenged i.p. with 2.5 × 105 A20 cells of A20 lymphoma on day 0. Then on days 1, 4, 8, and 18 mice were immunized with 2 μg of DNA constructs expressing sFv20 fused with human MCP-3 or murine IP-10 (A; pMCP3sFv20 and pIP10sFv20, respectively; the experiment was repeated eight times) or murine β-defensin 2, β-defensin 3, or MIP-3α (B; pmDF2βsFv20, pmDF3βsFv20, and pmMIP3αsFv20, respectively; the experiment was repeated three times). The control group was treated with construct expressing irrelevant lymphoma sFv38 or EGFP Ag fused with human MCP-3 or IP-10 (A; pMCP3-EGFP and pIP10sFv38, respectively) or murine β-defensin 2 (B; pmDF2βsFv38). The log-rank p value is for comparison with pMCP3-EGFP (A) or pmDF2βsFv38 (B), respectively. C, Winn assay. Ten mice per group were adoptively transferred with a lethal dose of A20 tumor mixed with splenocytes from either pMCP3sFv20- or mock-immunized mice. The experiment was repeated twice. Similar experiments were performed using β-defensin vaccines. Tumor-bearing mice (10 mice/group) were immunized with 2 μg of DNA vaccine expressing β-defensin 2 and 3 fusions with sFv20 (pmMIP3αsFv20, pmDF2βsFv20, and pmDF3βsFv20) starting 1 day after challenge with a lethal dose of A20 tumor, followed by three booster vaccinations. There were no survivors among tumor-bearing mice randomized to control treatment with the same β-defensin but fused with sFv derived from the 38C-13 lymphoma (pmDF2βsFv38; Fig. 4⇑B), suggesting that nonspecific effects of β-defensins were apparently not sufficient for tumor eradication. In contrast, a significant number of surviving mice were observed in the pmDF2βsFv20 treatment group, as shown by the representative experiment in Fig. 4⇑B (by log-rank test, p < 0.002 compared with pmDF2βsFv38). It is notable that in this model, although the β-defensin 3 fusion vaccine also induced a superior specific Ab production (data not shown), the vaccine was not able to elicit antitumor immunity (Fig. 4⇑B). Superior Ab production also was generated by vaccinating with A20 lymphoma derived Ig-KLH protein (21), although it was not sufficient to elicit both protective (21) and therapeutic immunity in A20 model. Thus, these data suggest that induction of humoral immunity is not sufficient to eradicate A20 B cell lymphoma, and that fusions with inflammatory chemokines MCP-3 and MIP-3α or β-defensin 2 induced specific cellular antitumor responses. Previously we reported that antitumor immunity in the 38C13 lymphoma model, induced with MCP-3 fusion constructs, required effector CD8+ T cells (21). To further elucidate the basis for the antitumor effects, 10 naive BALB/c mice/group were subjected to adoptive transfer of a lethal dose of A20 tumor mixed with sera or splenocytes from immune mice. No protection was observed in mice injected with A20 tumor mixed with immune serum (data not shown). However, the mice that received splenocytes from mice immunized with pMCP3sFv20, but not from mock-treated mice, exhibited significant prolongation of survival (by log-rank test, p < 0.01; Fig. 4⇑C). Although we and others have not yet been able to demonstrate Id-specific cellular immunity in A20 or 38C13 tumor models, these data suggest that DNA vaccinations with lymphoma Id-derived sFv chemokine or defensin induce cellular immunity that can be transferred with immune cells. Next we tested whether β-defensin needs to be physically linked with sFv by immunizing with a mixture of unlinked β-defensin and sFv. 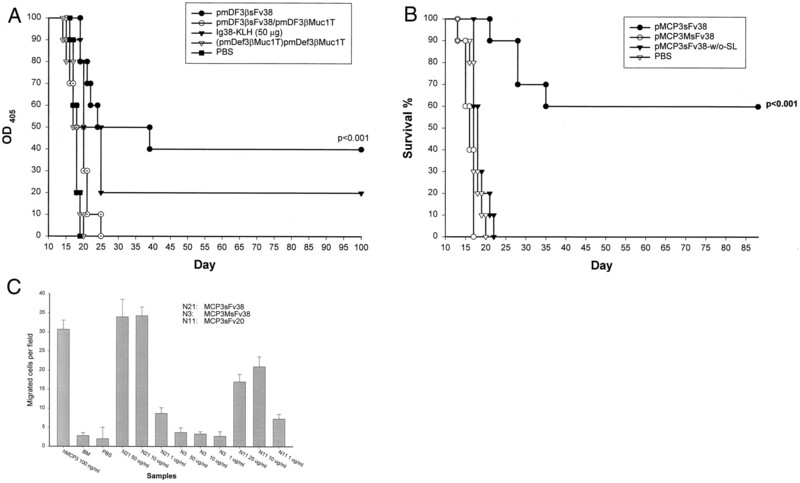 Ten mice per group immunized with a mixture of separate plasmids encoding β-defensin 3 (pmDF3βMuc1T) and sFv Ag (sFv38) failed to elicit a specific humoral response, thus demonstrating a requirement for sFv to be physically linked to β-defensin (Fig. 2⇑A). Furthermore, these mice challenged with a lethal dose of syngeneic 38C13 tumor exhibited no protection (data not shown). These data also suggest that chemokine receptor engagement with chemokine- or defensin-sFv fusion is essential for the induction of immunity. It was not sufficient to simply attract APC or induce inflammation at the site of production of sFv Ag; direct APC targeting with Ag fused to β-defensin or chemokine was required, presumably via the involvement of chemotactic receptors. To further test this idea, we tried to inhibit this receptor-mediated immunity by injection of the competing ligand. C3H mice (10/group) were immunized with either pmDF3βsFv38 alone or mixed with DNA encoding β-defensin fused with irrelevant Ag (pmDF3βMuc1T; Fig. 5⇓A). Sera from mice immunized with a plasmid encoding sFv protein fused with murine β-defensin 3 by itself or in the presence of an irrelevant plasmid contained ∼300 μg/ml idiotype-specific Abs, on the average, which was 2- to 3-fold higher than the levels induced by vaccination with tumor-derived intact Ig protein conjugated to KLH. However, much lower levels (5–15 μg/ml) of specific Abs were detected in sera of mice coimmunized with pmDF3βsFv38 mixed with competing pmDF3βMuc1T. Two weeks after the last immunization all mice were challenged with a 20-fold lethal dose of syngeneic 38C13 tumor. No survival was observed in control groups immunized with PBS or plasmid encoding β-defensin 3 fused with an irrelevant Ag (pmDF3βMuc1T; Fig. 5⇓A). Similarly, no protection was detected in mice coimmunized with pmDF3βsFv38 and competing pmDF3βMuc1T (pmDF3βMuc1T/pmDF3βsFv38; Fig. 5⇓A). In contrast, 40% of mice immunized with pmDF3βsFv38 were protected (by log-rank test, p < 0.001 compared with pmDF3βMuc1T; Fig. 5⇓A). Therefore, these data support the view that immunity to nonimmunogenic tumor Ags fused with defensins or chemokines depended on their ability to engage chemokine receptor(s). The potency of genetic immunizations with chemokine or defensin fusion constructs depends on chemokine receptor engagement. A, Effects of ligand competition (pmDF3βsFv38/pmDF3βMuc1T). Vaccine expressing sFv38 fusion construct with the murine β-defensin 3, pmDF3βsFv38, was coinjected with murine β-defensin 3 fused with the control Ag Muc1, pmDF3βMuc1T. C3H mice were gene gun immunized with gold particles that were coated with mixture of DNA (2 μg) encoding pmDF3βMuc1T and pmDF3βsFv38 (pmDF3βMuc1T+pmDF3βsFv38). Control mice were injected with gold particles coated with pmDF3βsFv38 mixed with control plasmid (pmDF3βsFv38). Two weeks after the last immunization, all mice were challenged with 2 × 103 (20-fold lethal dose)/mouse 38C13 lymphoma cells, and tumor progression was followed. Control mice were immunized with pmDF3βMuc1T, Ig38-KLH (50 μg/mouse i.p. ), or 200 μl PBS. The log-rank p value is for the comparison with pmDF3βMuc1T. The experiment was repeated twice with 10 mice/group. B, Importance of secretion of functionally active chemokine fusions. Ten mice per group were challenged with a 20-fold lethal dose of 38C13 tumor cells 2 wk after the last immunization with DNA constructs encoding functionally active chemokine fusion gene either with a secretion signal sequence (pMCP3sFv38) or with a deleted secretion signal sequence (MCP3sFv38-w/o-SL). Control mice were immunized with DNA expressing sFv38 fusion containing intact secretion leader sequence, but functionally inactive MCP-3 (pMCP3MsFv38). The log-rank p value is for comparisons with MCP3sFv38 (without SL) and pMCP3MsFv38. C, In vitro chemotaxis data that demonstrate that purified sFv fusion proteins from 38C13 and A20 lymphomas (MCP3sFv38 and MCP3sFv20, respectively) with wild-type MCP-3, but not mutant MCP-3(MCP-3MsFv38), chemoattracted THP-1 cells. Cells were incubated with titrated amounts of the purified sFv fusion proteins (micrograms per milliliter). Human MCP-3 (100 ng/ml) or medium alone was used as the control. The results are shown as the number of migrated cells per field ± SD of triplicate wells. Similar results were obtained from three separate experiments. BM, Binding medium. Since we vaccinated mice by cutaneous DNA bombardment, LC and DC residing in the skin may take up, express, and present sFv Ag directly. Alternatively, these cells might be primed by chemokine-sFv protein expressed and secreted by bystander cells. To distinguish between these two possibilities, mice were immunized with MCP-3 fusion constructs with or without a secretory leader sequence (pMCP3sFv38 and pMCP3sFv38-w/o-SL, respectively). High levels of Id-specific Abs were detected in mice immunized with pMCP3sFv38 containing an intact secretory leader; however, no Abs were elicited in mice immunized with pMCP3sFv38-w/o-SL (data not shown). Furthermore, tumor protection was elicited only in those mice immunized with pMCP3sFv38, but not in those immunized with pMCP3sFv38-w/o-SL (by log-rank test, p < 0.001; Fig. 5⇑B). In addition, no protection was detected in mice immunized with DNA expressing a secretable, but mutated, MCP-3 fusion protein, which could not bind the respective receptor (pMCP3MsFv38; Fig. 5⇑B). The inability of the MCP3MsFv38 construct to bind chemokine receptor was supported by its inability to chemoattract THP-1 cells in vitro (Fig. 5⇑C). These data are consistent with the hypothesis that immunity was induced primarily by APC which took up (via chemokine receptor) a functionally active chemokine fusion protein that was produced and secreted by transduced bystander or APC cells rather than by APC directly being transduced by gene gun immunization. Herein we demonstrate that a model nonimmunogenic tumor Ag, lymphoma idiotype (29), is rendered immunogenic when genetically fused with ligands, such as β-defensins 2 and 3, or inflammatory chemokines MIP-3α and MCP-3, which target receptors preferentially expressed on iDC (16, 30). This immunity is correlated with the ability of murine β-defensins 2 and 3 or inflammatory chemokine MIP-3α to induce chemotaxis of murine bone marrow-derived immature, but not mature, DC. Human β-defensin 2 binds to CCR6 preferentially expressed on iDC and resting memory T cells (18, 28), but the murine β-defensin receptor(s) has not been identified to date. Herein we demonstrate for the first time that both murine β-defensins 2 and 3 also bind to CCR6 (Fig. 1⇑), although the possibility that β-defensins bind to other receptors is not excluded. The involvement of additional receptors may explain the differences in immune responses induced by β-defensins 2 and 3. For example, β-defensin 3 fusion constructs generated higher Ab titers in both tumor models, but, unlike β-defensin 2, did not elicit antitumor immunity in the A20 model. The importance of targeting immature DC residing in the skin (a site of Ag production) is also supported by data obtained from mice immunized with another inflammatory chemokine, IP-10, which binds to CXCR3. This receptor is not detected in skin cells, such as epidermal DC and keratinocytes, although it is expressed in normal human lymphoid organs by certain subsets of DC, specifically myeloid-derived CD11c-positive cells, and by peripheral B cells (32, 33). We previously reported that substantial infiltration of mononuclear cells and polymorphonuclear leukocytes was detected at the site of injection of IP-10 or MCP-3 fusion proteins (21). However, mice immunized with IP-10 fusion constructs also failed to elicit efficient antitumor immunity in the A20 tumor model despite the generation of humoral immunity. Furthermore, no antitumor immunity was elicited when we used the homeostatic chemokines SLC and SDF1β, which bind to receptors expressed on mature DC. The lack of antitumor immunity in mice immunized with homeostatic chemokine fusion constructs is not due to inadequate expression of the fusion genes, since both constructs were comparably expressed by transient transfection assay in HEK293 cells (data not shown). The integrity of the chemokine was also not impaired, since SDF fusion protein competed specifically with native labeled SDF1α for binding to CXCR4 (data not shown). Moreover, mice immunized with the SLC fusion construct generated Id-specific Ab comparable with MIP-3α fusion vaccine (Fig. 2⇑B). This indicates that CCR7-expressing APC have the capacity to take, process, and present nonimmunogenic Ag sufficiently well to induce a humoral immune response. Even though SDF1β fusion proteins can also interact with CXCR4 on immature DC, whether their availability might be reduced because CXCR4 is expressed by many different cells or by the presence of competing native SDF1 needs further studies. Taken together, the appeal of using fusion constructs with defensin or chemokine ligands was based not only on the ability of these mediators of innate and adaptive immunity to target surface receptors on APC, particularly on iDC (18), presumably resulting in increased uptake of Ag, but possibly also to induce the expression of costimulatory molecules and, in turn, the production of other proinflammatory cytokines and factor. The importance of coexpression of genes for costimulatory molecules B-7.1 and CD-40 for induction of immune responses against weak immunogens has been repeatedly reported by others (34, 35, 36, 37). Human α-defensins induce the expression of costimulatory molecules on lymphocytes (20) and the production of proinflammatory cytokines (38). The potential effects of inflammatory chemokine or β-defensin fusions on the induction of local inflammation in vivo need to be elucidated. It is tempting to speculate that they may target not only Ag to a receptor(s) on APC, but also preferentially prime for Th1 or Th2 cytokine responses in vivo. Moreover, Th1 or Th2 cells could be differentially attracted by chemokines, thus modulating immunity. For example, MCP-1 stimulates IL-4 production (39) and thereby induces control Th2 polarization (40). Moreover, macrophage-derived chemokine, CCL22 (MDC), has been reported to selectively chemoattract Th2 cells toward APC (41). In support of this view, we also observed in A20 tumor models that nonimmunogenic tumor Ags fused with MDC induced inefficient therapeutic antitumor immunity despite inducing the production of high levels of specific Ab (data not shown). Therefore, these data suggest that nonimmunogenic tumor Ags are rendered immunogenic by linking them as fusion constructs to proinflammatory ligands to target immature DC. The identity of chemokine or defensin moieties determines whether humoral and/or cellular immunity are induced. The fusion constructs were delivered by cutaneous DNA bombardment and therefore could have been expressed directly in LC and other APC residing in the skin (34, 42). However, experiments with constructs designed to either secrete or express fusion proteins in intracellular compartments clearly demonstrated that secretion was required, although we cannot completely rule out a role of directly transduced APC. Moreover, the mechanism of targeting of APC by secreted fusion proteins was supported by evidence for a receptor-dependent process, since idiotype-specific Ab and protective antitumor immunity were elicited only in mice immunized with DNA encoding fusion constructs with functionally active murine β-defensins or proinflammatory chemokines. Immunizations with fusion constructs encoding mutant chemokine or an inactive β-pro-defensin moiety, which could not bind to the respective chemokine receptor and induce chemotaxis, failed to elicit any immune response. In addition, induction of chemotaxis alone to the site of Ag production by unfused mixtures of ligands and Ag was not sufficient to induce nonresponsiveness to tumor Ag, probably due to inefficient uptake of Ag by infiltrating cells. Specifically, no immune responses were elicited in mice immunized with a combination of DNA expressing free, unlinked murine β-defensin or chemokine and either DNA encoding sFv Ag (Fig. 2⇑) or sFv protein alone (data not shown). Only sFv physically linked with the defensin/chemokine moiety elicited efficient antitumor immunity. The ability to efficiently induce both types of adaptive immune responses, humoral and cellular, may explain the effect on established lymphoma in mice immunized by DNA encoding inflammatory chemokine or β-defensin 2 fusion proteins (Figs. 3⇑ and 4⇑). It is noteworthy that the use of these fusion constructs yielded superior protective immunity than intact Ig protein conjugated to carrier (KLH), the prototype vaccine currently in Phase III clinical testing against human lymphoma (1). In particular, immunizations with MIP-3α and MCP-3 or β-defensin 2 fusion constructs elicited protective and therapeutic antitumor immunity against the A20 lymphoma, a model in which Ig-KLH and other idiotypic vaccine formulations previously failed (21). In contrast with the A20 model, generation of Id-specific Ab contributes to the protection against 38C13 lymphoma (3) (21). As we reported previously, tumor protection was abrogated completely by depletion of CD8+ effector cells in mice vaccinated with pMCP3sFv38 (21). Although we and others have not yet been able to demonstrate Id-specific cellular immunity in A20 or 38C13 tumor models using a conventional CTL assay, the Id-specific cellular immunity can be transferred by adoptive transfer of immune splenocytes (Fig. 4⇑C), but not sera (data not shown). In agreement with this, we recently demonstrated that mice immunized with MCP-3 or β-defensin 2, but not β-defensin 3 or MDC, fusion constructs induced significant CD8+ CTL (both systemic and mucosal) against Env protein of HIV-1, in addition to high levels of Abs (A. Biragyn, I. M. Belyakov, Y. H. Chow, T. C. VanCott, D. C. Dimitrov, J. A. Berzofsky, and L. W. Kwak, manuscript in preparation). These results are also consistent with our previous observation that protective antilymphoma immunity elicited by MCP-3 sFv fusion vaccines required effector CD8+ T cells (21). These data suggest that DNA vaccinations with lymphoma Id-derived sFv (nonimmunogenic tumor Ag) fused with inflammatory chemokines MIP-3α and MCP-3 or β-defensin 2, which target immature DC, induce both humoral and cellular immunities. Overall, our data suggest that the use of these ligands linked to tumor Ags could provide a general strategy for the development of simpler and more effective vaccine formulations for human use. We are grateful to O. C. Bowersox and Qian Chen for technical assistance, to Ronald Hornung for help with isolation of murine bone marrow-derived DC, to Dr. William Murphy (Science Application International Corp.-Frederick) for help with the Winn assay, to Dr. Patrick Hwu (National Cancer Institute, National Institutes of Health) for providing the DC isolation technique, and to Dr. Joshua Farber (National Institute of Allergy and Infectious Disease, National Institute of Health) for the gift of HEK293/CCR6. ↵2 On leave of absence from the Divisione di Oncologia Medica Falck, Ospedale Niguarda Ca Granda, Milan, Italy. ↵3 Abbreviations used in this paper: sFv, single-chain Fv fragment; DC, dendritic cell; iDC, immature dendritic cell; IP-10, IFN-γ-inducible protein 10; KLH, keyhole limpet hemocyanin; LC, Langerhans cell; MCP, monocyte chemoattractant protein; MIP, macrophage-inflammatory protein; ELC, EBV-induced molecule 1 ligand chemokine, CCL19; SLC, secondary lymphoid tissue chemokine, CCL21; MDC, macrophage-derived chemokine, CCL22.